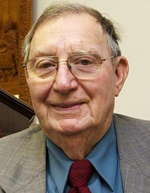 The funeral service for Calvin E. Wolf, 90, a longtime Stewartville resident, will be held at 11 a.m. on Saturday, March 30, 2019 at Zion Lutheran Church in Stewartville with Rev. Byron Meline officiating. Burial will be at Holden Lutheran Church in rural Kenyon. Mr. Wolf died on Sunday, March 17, 2019 of natural causes at Abbott Northwestern Hospital in Minneapolis. Calvin Erwin Wolf was born on Aug. 10, 1928 in Faribault, to Erwin and Marie (Schmidtke) Wolf. He grew up on the family farm, attended Nerstrand School and Faribault School District, graduating from Faribault High School in 1945. He enrolled and attended what is now Minnesota State University-Mankato and received his bachelor of science in chemistry. While at MSU he was introduced to Clarice L. Voxland who was teaching in nearby Waterville. Following his graduation from MSU, he was hired as a teacher/principal in the Peterson area. Within eight weeks of starting his first teaching job, he was drafted into the US Army, trained at Fort Knox, Ken. as a tank driver and was sent to post-WW II Germany. He returned home for a two- week leave and was married on Feb. 28, 1952 at Holden Lutheran Church in rural Kenyon to Clarice L. Voxland. He returned to Germany, where his young wife joined him and lived in Germany until he was discharged from the US Army. Following his discharge, the couple returned to Mankato, where Calvin continued his graduate level studies in chemistry. In 1954 Calvin and Clarice moved to Byron, where Calvin taught math. He moved to Stewartville in 1956. While in Stewartville, Calvin taught a variety of classes including math, chemistry, biology, and middle school earth sciences, until his retirement in 1990. Calvin continued his professional education throughout his career taking summer school classes at Cleveland State University in Cleveland, Ohio, and at Macalester College in St Paul. Cal and Clarice raised their family in Stewartville, where they continued to make their home for 63 years. They recently moved to Northfield Retirement Community in Northfield. Calvin was a longtime member of Zion Lutheran Church in Stewartville, where he was active with Sunday school and Bible studies. Calvin sang proudly with the Rochester Male Chorus for more than 50 years. Two memorable performances of the National Anthem were at the Cotton Bowl game in Texas and for President Richard M. Nixon at the White House. Cal was a Mason and member of the Stewartville Masonic Lodge No. 203. Locally he was a Rotary Club and Lions Club member. Calvin's other passions included playing cards with Clarice, current science events, geology, fossil hunting, astronomy, his wood shop, and home improvement projects. He enjoyed and loved spending time with friends and family. His faith in Christ our Lord, his family and his brothers, sister, in-laws, nieces and nephews were paramount throughout his life. He will always be remembered for his proud German family heritage. Calvin is survived by four sons, Todd (Diane) of North Hudson, Wis., Keith (Barbara) of Edina, Davis of Kenyon, and Kent (Lou) of Woodbury; nine grandchildren, Jessica (Todd) Neuman, Matthew (Jessica) Wolf, William Wolf, Alexander Wolf, Maxwell Wolf, Olivia Wolf, Andrew Wolf, Nicholas Wolf, and Grace Wolf; five great-grandchildren, Isabelle and Henry Neumann, and Charlie, Christopher and Frederick Wolf. He was preceded in death by his wife, Clarice Lorraine Wolf; daughter, Julie Lorraine Wolf; his parents, Erwin and Marie Wolf, and two brothers and two sisters, Woodrow (Elizabeth) Wolf, Kermit (Opal) Wolf, Beatrice (Harland) Wille and an infant sister. A time of visitation will take place from 9:30-11 a.m. on Saturday, March 30, 2019 at Zion Lutheran Church in Stewartville, prior to the funeral at Zion on Saturday morning.